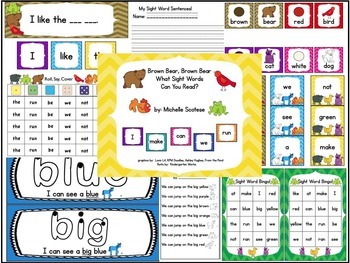 Brown Bear Brown Bear What Sight Words Can You Read? 1. 10 simple sentences for the students to put together with brown bear word cards. There are sentence strips to help guide them and handwriting pages to write the sentences as they complete them. The sight words are: I, red, can, blue, big, yellow, the, run, be, we, not, ran, see, green, am, a, make, at, like, orange, must, one, jump, brown, on.